But if you want to give a jewel with so important and so valuable meaning, it’s normal that some questions and doubts raise. What will be the perfect engagement ring? How do I know what shape or color should be? Where do I start …? Now that you have decided that you want to ask your girlfriend to marry … do you have to worry about how? Obviously not! Smile, relax, you just arrived the right place. You’ve just made a very important choice, and that led you to navigate through a sea of ​​engagement rings: each jeweler tries to sell their jewelry models without considering the most important : the person who will wear it. Rings made in series, metal and finishes of questionable quality, diamonds of different color or models antiquated not accompany the value to be transmitted. Today, jewellers don’t make jewels themselves, and they can not give more information that the one that explains them the manufacturer (which should not be too …). They want to sell emphasizing on low prices, or simply they do not have time to listen to every story and have dedication to be able to give you valid advice to make a decision as important as choosing your perfect engagement ring. Well, all this is behind us now, you’ve found us! As a jewelery workshop, we are with you in this way to help you choose your ring with diamonds, and we’ll begin now giving you some information! We created this guide to help you reveal each of the issues with which you can find when you are in search of the perfect engagement ring. All these questions are the “top ten” . How in history started engagement rings? If we want to understand the meaning of the engagement rings gifts, we’ll have to do a small look to the past. Egyptian ancient civilizations already give engagement rings, which were nothing more than a metal ring. It was later adopted by the Romans, but the man who wants to be promised, gave the engagement ring to the father of the bride (can not imagine how he should do it right style …), and she received a second engagement ring with the shape of a key that allowed her to open boxes with family relics. This engagement ring was acquiring a meaning full of confidence, as it the meant access to all the most valuable possessions of the families. These types of engagement rings between lovers have always meant three things; commitment, trust and eternity. And what a better symbol of eternity than a diamond? Almost indestructible, does not scratch or will be damaged with the passage of time, still shining with the strength of the first day. In 1947, France Gerety published the most famous slogans of the time: “A diamond is forever”, “A diamond is forever” was declared the best slogan of the twentieth century, and increase the popularity of diamond engagement rings to the point now that all lucky women have one shining in his hand. There are types of engagement rings? Yes, an engagement ring can be of many shapes and special designs, but the two predominant forms are “solitaire” and “diamond ring“. The solitaire engagement ring is a bright gold 18 kt (usually white gold) with a diamond (usually brilliant cut). The diamonds ring is also a ring of bright gold 18 kt with diamonds all over it (alliance complete) or only in the upper half (half alliance ). Diamonds can be of very different sizes, or even special cuts, like princess cut diamonds and baguette cut diamonds. What is the significance of the shape of an engagement ring? 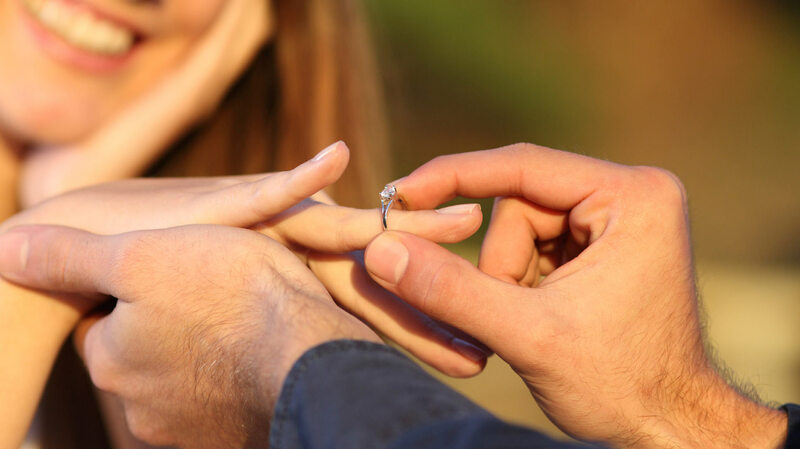 There are three values ​​that transmits the engagement rings. An engagement ring means the union, so an engagement ring is circular and joined without any break. A forged thread that can not be broken, all of one piece. Metals such as white gold reflect the nobility of feeling and give it the value it deserves. Gold is a noble metal, hard and appreciated that endures and shines. The diamond is a symbol of eternity that will reflect your love. Diamond is the hardest stone, which will not scratch, always retaining its shape and brightness, as your relationship. How much is normal to spend on an engagement ring? We start from the idea that of all the gifts that you will make, the engagement ring will be the most important. The most sentimental and symbolic value, and will acquire them forever. Every day, we see the girls with very great enthusiasm about their engagement rings. In addition, with the passage of time, life will guide you to form a family, to grow in many ways, mature and something that seems inevitable, to make you older. We think that this diamond ring will always be at the height of the circumstances, without falling short in his appearance ever. So, we always recommend that, as far as the possibilities of each one, and bearing in mind the style of the girl, buy the best engagement ring. Now this leads us much either, right? Then there is the general idea that two months of your salary would be something appropriate and generous. Another advantage of working with us as a jewelery workshop is that you’ll get more for the same price. And speaking of that, flee deals, bargains and other sneaky deals. In the world of the diamond, all professionals know quite what to buy, what to sell and what price we have to do. When you find something very cheap, it is because something happens (eg. diamonds laser drilled to remove inclusions, and then filled with resin invisible). Shall you could give me an overview of the qualities of diamonds? For engagement rings normally we use brilliant cut because it returns the most of the light. This means that the cut of the diamond is in facets in a specific way, because the light coming from up, and bouncing off the walls inside, goes up again, giving the greatest brightness. There are four features to watch for measuring quality of brilliant cut diamonds, called 4C because it is the home of all of them. Purity of a brilliant (Clarity): Brilliants have small inclusions that make them different. Depending on the size or position of these inclusions, the brilliant will be classified by an expert with a 10X magnifier. Weight in carat of a brilliant(Carat): The most visual of all the criteria is the weight of a brilliant and therefore its size. We use high-precision scales to weight in carats, equivalent to 0.2 grams. Cut of a brilliant (Cut): A good cut is the most important factor in choosing quality of a brilliant. The cut is what will make the light to trip properly throug it and shine with all the intensity possible. Inappropriate cuts will affect much light travel, and therefore decrease the brightness. All this information is handy to know, because if, for example, you choose an small brilliant, but with excellent cut, will make much more effect than a large brilliant with a regular cut. But relax, you do not need to learn all this by heart! ‘So we’re us, to help you in the more technical issues! And if the engagement ring does not match her finger size? There is no problem! This is one of the issues of greatest concern, which is the easiest to fix. We always do engagement rings little larger than we estimate (as we see pictures of the girl and her hands). So when you give her, she can try it (and it will not be so embarrassing, if the engagement ring does not match!). Once you’ve given her, if the size is not correct, you can return with her to our jewelery workshop, we will take the exact measurement and size the engagement ring. Oh, and you will not notice anything! And if she does not like the engagement ring? A gift that has been designed, chosen and looked for the person that you want, and with our help and expertise, obviously will be pleasent. There’s no doubt. We hit ever! When a man comes to our jewelery workshop looking for an engagement ring, we always ask questions, or ask him to show us a picture of her, to advise the best choice; How is it physically your girlfriend? What style of clothing does she wear? How are the jewels that usually wears? And many others. We can better understand her style and know what are her preferences. All this can help you a lot to choose your ideal engagement ring with diamonds. Trust us! An engagement ring, can be engraved? Most brilliant engagement rings can be engraved. It always depends on the inner surface they have, and what you want to express. Normally they are engraved with your name and the date (here’s the trick because she always remember to celebrate the day!). We also have an artistic manual engraver. And if you have not decided what will be the day that you will ask her in marriage, we can always engrave the engagement ring after you make the gift. When should I start looking for an engagement ring? How much time it takes to create an engagement ring? The sooner the better. All will be easier if you have time. Choosing an engagement ring or to make an engagement ring design is a process that requires some dedication. All our engagement rings are crafted with the utmost effort and rigor, from design to finish, through forging (yes, as ancient swords!) So it took about 10 days to create an engagement ring (sometimes less, if you can not wait to hear “yes I want!). How can I give her the engagement ring? There are countless ways of giving an engagement ring! How many commitments in our jewelery workshop we heard incredible and fabulous stories, as will surely be yours. The most important thing is that you can be in a quiet place without much noise or interference, allowing one to be close to each other. She will also express their feelings. To give an engagement ring is not a one-way action, but generates a response of surprise, excitement and of course, love. It should be a place that facilitates communication, in which the two can express freely and clearly the feelings and emotions. If you choose a special place, where the details are well cared for, it will give more value to your action. May be a bouquet of flowers, a few lights, music … Beautiful surrounding beauty! This site will last in your memory forever. And your gift of an engagement ring will be an unrivaled success.